Entertaining from an Ethnic Indian Kitchen offers a single memorable asset - traditional Indian culinary ideas fused with a charming international flair. This book is a beautiful quilt of “what is” and “what can be”, each piece distinctly different from the other. Some ideas are presented with subtle variations whilst others are presented with a dramatic twist. The most interesting aspect of this book, sure to make it a favored culinary companion, are the unique personal reflections of the author, Komali Nunna. Venturing far beyond sumptuous recipes, she provides insights into the fascinating world that is India; the people, languages, festivals, rituals, historical and geographical influences on the regional cuisines are all eloquently presented. The robust diversity of the different states of India are beautifully captured in every recipe, complete with the special touches unique to the region. For those familiar with India, it brings a comforting sense of acquaintance and familiarity while others will find this book an educational experience in the innovative style of entertaining, preparing and presenting a variety of foods with a novel trademark touch. The book touches upon the tiny and often overlooked details that establish a memorable impact on one’s entertaining style. There is an easy, relaxed flow of thoughts and ideas that provide a sense of creative expression to cooking and presentation. Gorgeous table settings, adorable accessories, unique serving ware, flower arrangements, fabric choices and unusual uses for commonly found items all compose the signature style of the author. Ideas range from warm, cozy fireplace dinners to elegant formal dining, complete with full course menu selections for any style and simple practical tips on making any event special. Her mission is simple; get creative with traditions and enjoy the unexpected pleasures. Throughout the book, she strives to explain and hold on to some traditions while making bold attempts to enrich others. Her zeal for cooking is made apparent by her eagerness to celebrate and infuse local culture with her own ideas acquired from a country that has lovingly nurtured her adventurous creativeness by providing ample opportunity to experiment, amuse, and savor. 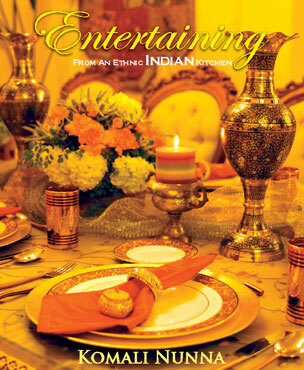 Entertaining from an Ethnic Indian Kitchen is an engaging book on entertaining, a visual treat that is sure to fire up your taste buds, and an experience that will encourage you to free your mind and watch it flower.